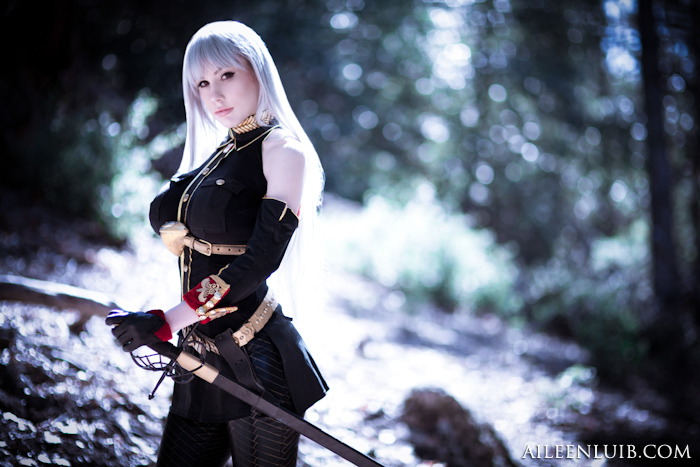 Back when I first joined DeviantArt, I occasionally saw photos on my homepage of this extraordinary Selvaria Bles cosplayer and was mesmerized each time. Valkyria Chronicles was my favorite video game, so it was amazing to see a talented person bring one of my favorite characters to life through costumes. Eventually I was able to find her on DeviantArt: her name was Crystal Graziano. Eventually I drew up the courage to send her a message about a photo shoot. I prayed she would respond, and she did! I photographed her Selvaria Bles cosplay as well as her husband Todd’s Radi Jaeger costume, which was an expected treat – Bles and Jaeger were both villains in Valkyria Chronicles, so shooting this dynamic duo was a dream-come-true for me. Although I discovered Crystal through her costumes, she is also an artist as well. 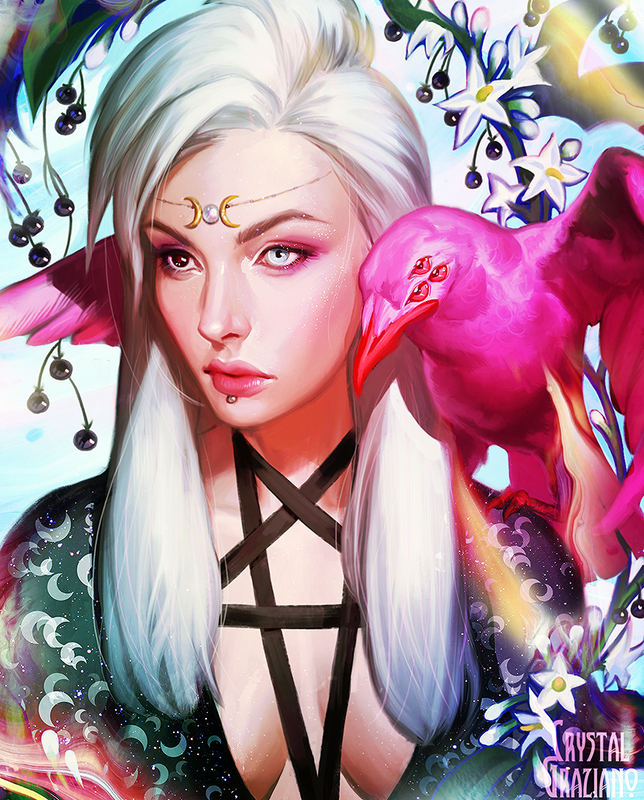 Since entering art school, she’s worked tirelessly to not only improve her illustration but also create a steady income through selling her artwork. 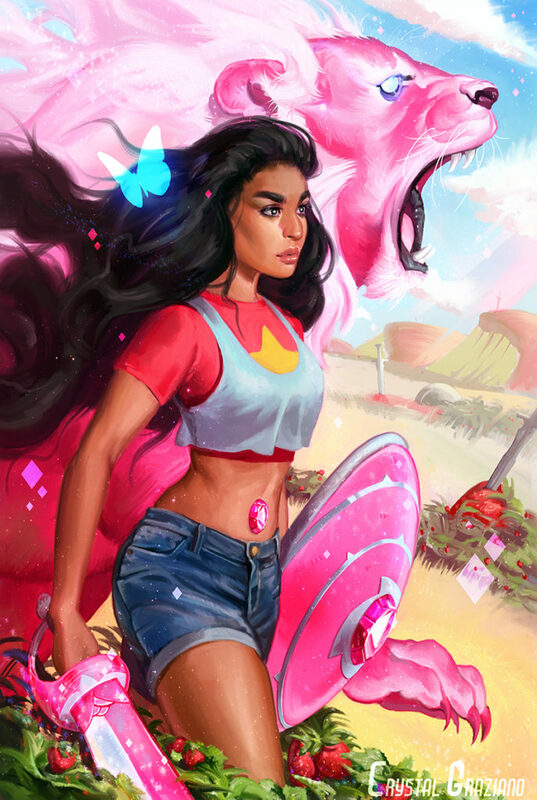 Widely known for paying artistic tribute to favorites like Metal Gear and Ghost in the Shell, Crystal has been able to make a career out of what she loves: create art work through all mediums based on her favorite video games and TV shows. Of course, success is never without a few setbacks and some sacrifice. With the support of her husband, family and friends, Crystal has worked through many obstacles to get where she is today. 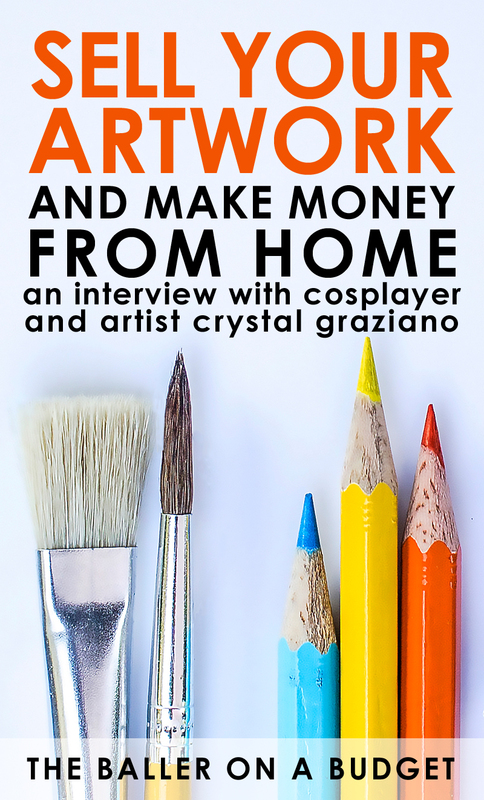 Read more below to learn more about how Crystal transitioned from a casual cosplayer to a freelance artist. 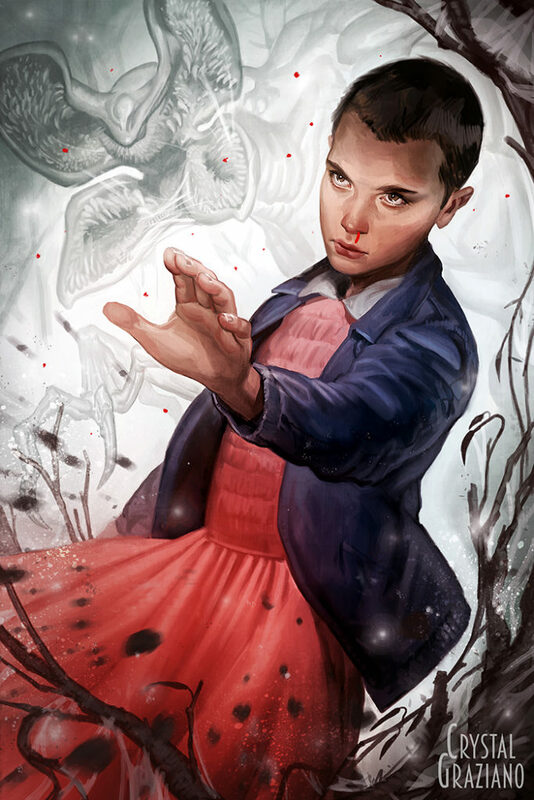 What first got you interested in art and cosplay? For art, I mainly wanted to draw fan art of my favorite games and shows, and for cosplay I wanted to make costumes for those same things! I’ve developed more interest in painting original works, but I still really love doing fan tributes both in art and cosplay. I’d been drawing for a few months in my spare time while going to college with zero interest in my major. I knew that most jobs besides art would bore me out of my mind, so I left the university to go study art at a private atelier and hoped for the best. It was more a leap of desperation that wound up making me a living. Did you encounter any obstacles or troublesome times when you were starting out? My husband was laid off about a year after I started my art classes, so I very suddenly had to start making money to support us both. I was fortunate in that I had started to get freelance work offers around that time, but the income for freelance when you’re starting out isn’t great, especially when you’re the only one supporting two people in Southern California. Rather than getting a more conventional side job, I found more ways to monetize my art via Patreon and my own prints sales. It was pretty stressful but it worked! I remember a few years back you got a really amazing gig with the video game company Firefall. How did that happen? I had a great experience with Firefall! They were looking for a cosplayer to be their character Mourningstar at shows, and one of my awesome cosplay fans suggested me to the company. After a few emails and an interview, I got the gig! That whole year was amazing; I went to four shows in the US and one in Germany with the team, which included the late Lee Reherman as my cosplay partner for Typhon. We had some amazing interactions with fans, and the costumes were made by Steve Wang, the same guy responsible for the Predator suit, Hellboy costumes, and more. It was really a dream opportunity. Aside from your cosplay, I know you’ve been going to school to study art, which I think is a really brave and incredible thing to do. How has your journey been so far? Honestly, it’s been amazing! I started at Watts Atelier in 2014, and it changed my life. It was way more affordable than going to a university, and the education I got enabled me to start landing jobs after only a year. I haven’t been able to take more than one or two classes at a time since I started working professionally, but I’m hoping to take some time off and really dive into oil painting at some point. Your art has developed and grown very refined since you started attending school. You’ve been selling your art online and at your own booths at conventions. Is this a lot of work? Thank you! Online art sales is time-consuming because of the packing and shipping involved, but it’s turned out to be a good steady income for me. I consolidated everything to shipping weekly to keep things manageable for the rest of my art business. Doing convention sales is my favorite! I love traveling, so it’s an excuse to fly out to a different part of the country. Unfortunately, it requires a lot of prep work ahead of time to make sure all my inventory and my displays are ready to go, and it’s always nerve wracking dropping a bunch of money on flights and hotels before the show. I love doing it though, and it’s a great boost to my normal income! You’ve had so many amazing networking opportunities the past few years. Have you ever been starstruck from anyone you’ve worked with? Working with Lee Reherman for Firefall was an amazing experience! He’s well-known for his work on American Gladiators, Arena, and many other shows and movies, and it was pretty intimidating at first to work alongside him in our cosplay roles. That said, he was such a warm and funny guy that he put me at ease almost right away. Watching him work was amazing; he had such a robust and outgoing personality that really drew in the crowd and made people laugh at the events we cosplayed at. I’m glad I got the chance to meet him and work with him. With massive success comes massive judgment. What’s it like being in the spotlight? Do you feel like there’s pressure from your fans and followers? Overall, my fans and followers for both my art and cosplay are pretty great. I don’t have an issue with people telling me I should or should not be doing or creating whatever arbitrary thing they want, and overall they are just supportive of whatever I’m doing at the time. Of course, having a large following does inevitably mean encountering a few bad apples, and I’ve had a number of people become a bit stalker-ish or cross the line. You just have to learn how to handle these types of situations, unfortunately. The block button comes in handy! It’s wonderful to see how supportive your husband Todd is about your endeavors. How does having a partner-in-crime who has the same interests help you both in your professional career as well as your personal life? 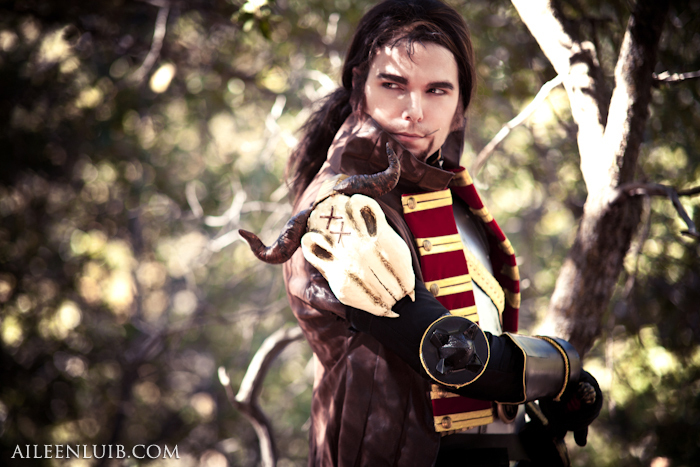 Todd is also super creative since he’s a cosplayer too (that’s how we met! ), and we share a lot of the same interests. He’s amazing to have around helping out, especially for cosplay. If I’m crunching for a deadline, he’ll help me out by making costume parts for me, and sometimes we collaborate on projects. He’s also great to have for my art business since he can my table at events while I take a break or help me pack orders at home, and I love bouncing ideas off of him. On a personal level, it’s really great to be with someone who appreciates me creatively and encourages it. We really work together as a team! What was your most memorable and successful opportunity to date? 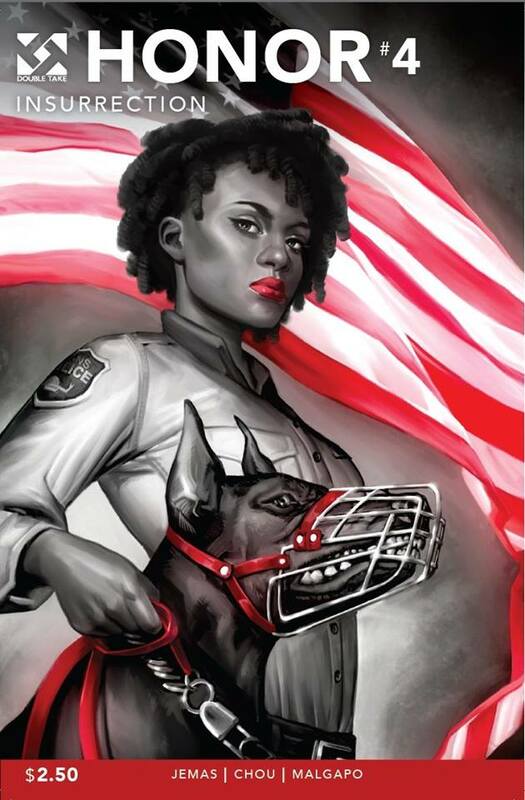 My first comic cover! It was for Double Takes‘ Honor comic series. It was a pretty good feeling when I unexpectedly saw it on the shelf at my local comic book store! What are your goals for your plan within the next year? Where do you see yourself by the end of 2017? I’m hoping in the next year that I can get a number of art goals checked off my list. First off, I want to learn oil painting well enough to paint something nice in the medium. I just started taking classes, but it’s difficult getting the hang of painting traditionally instead of digitally. I’d like to use the skill to branch out into selling more originals. Second, I have a comic int he planning stages that I’m hoping to self-publish, and I’m going to try to find the time to sit down and actually draw it up next year. And lastly, I just want to get better and faster overall, so I can work less and have more time to devote to other things I love, like cosplay or seeing friends. But self-improvement is always the eternal goal in art. The only thing that holds you back or moves you forward in an art career is ultimately yourself. 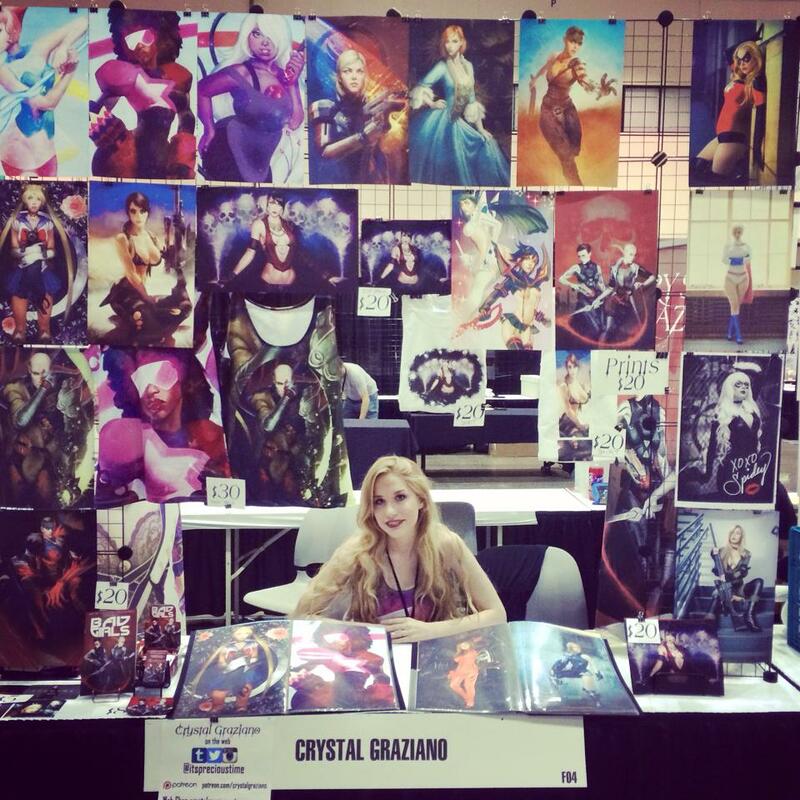 Crystal continues to sell her artwork both on her online store and at conventions across the world. When she’s not busy traveling, she creates artwork and costumes at home with the support of her husband, family, and her beloved Shiba Inu, Ginger. Liked this interview? Check out the entrepreneur interview archive for more inspiring individuals who’ve turned their passion into a business. Don’t forget to follow me on Instagram and subscribe to my newsletter below for more inspiring content!